As a new designer, I've been devouring everything I can find on designing knitwear - up to now, I've been designing what I know: small accessories - hats, mitts, socks, shawls. But eventually, I want to take it to the next level and design garments. Lucky for me, there are a number of books on this subject. They are mostly aimed at the home knitter rather than the knitwear designer, but the fundamentals are still useful. I already read and reviewed The Knitting Architect, and the next book I've been reading is Design to Fit by Pat Ashforth and Steve Plummer, the design duo otherwise known as Woolly Thoughts. The Woolly Thoughts team are best known for their mathematical and modular patterns and their books Woolly Thoughts and Second Thoughts. Design to Fit is a book of two parts. They were originally published separately as Creating Knitwear Designs and Making Knitwear Fit. 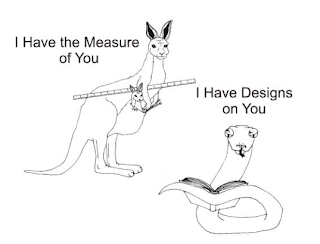 Now, the two sections of the book are entitled I Have Designs on You and I Have the Measure of You. 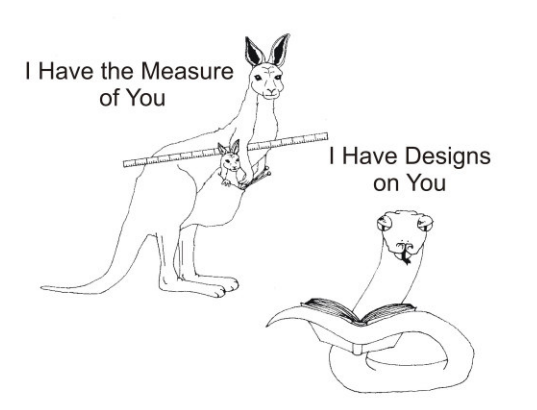 I Have Designs on You goes over all the basic shapes of jumpers from their very foundations - that is, starting with a tube, a sweater for a snake. Each sweater shape is broken down into its component shapes, and it is explained how one can knit to achieve those shapes. It's all very theoretical, which allows you to think about constructions in new ways than what you're used to. For instance, rather than learning how to knit either a bottom-up or top down sweater, you're learning the fundamentals to knit a sweater in any direction you choose. Top-down? Bottom-up? Side-to-side? On the bias? Once you understand the shapes, you can construct things any way you like. The examples go from simple to complex, so you can work your way up. The first section of the book also touches briefly on sizing and gauge, though this is covered more in-depth in the second half of the book. Since the books were originally published separately, there is some overlap of material. The most useful part of Design to Fit, for me as a designer, was the section on repeating patterns and stitches. There is a very in-depth section on how to adjust stripes and other patterns to make them fit into the space you have - useful not only for jumpers, but for any item with a stitch pattern. I found it extremely helpful and easy to understand. I Have the Measure of You is all about measurements and calculations - pretty dry stuff, if you ask me. But, math is a necessary evil in knitting. The first section goes over things such as how to measure garments, how to calculate tension and also how to measure it (with diagrams, so you can learn to identify the stitches). It also contains Metric/Imperial conversion charts for weight, length, and needle size. There's also a helpful section on calculating yardage based on area, even for things which aren't square. If you slept through high school geometry (like I did... snore) then this is an invaluable reference. The second section of the second book goes over how to create a simple jumper based on the measurements and gauge you've taken. It covers what pieces are needed and how they fit together, and simple shaping and how to calculate it. It may seem like common sense if you've knit a lot of sweaters before, but actually this was a really useful read for me. I can knit socks and hats in my sleep, no pattern required, but I've only tackled a few garments over the course of my knitting lifetime. Looking at a deconstructed sweater in a new way gives me a better understanding of how sweaters work, without having to rely on a pattern. All the calculations are based on sweaters knit bottom-up flat and seamed, even raglans (a seamed raglan! imagine! ), but with a little mental re-arranging, it's not hard to apply the information in the book to more seamless knitting or in the opposite direction. I have the Measure of You also includes some helpful sections on the various types of pockets, making increases or decreases line up evenly, and picking up stitches evenly. Each book also contains a short section on projects to knit using the information covered, such as a teddy-bear sweater in the first book and a baggy, Mr. Rogers-style cardigan in the second. At over 150 pages, and originally being two separate books, the ebook is a great value and will be useful to both the home designer and the budding pattern writer. I'm delighted to know you found it so helpful. It is good to read such a thorough review. The original books were very popular, particularly with colleges. It is nice to know what people found appealing and useful.